In many cases, each employee within an organization uses their own methodology or process for managing versions of files, or creating metadata. In addition, the organization as a whole may lack a policy regarding how to clean up or delete files. Because of these problems, there is no uniform methodology, and file shares have become polluted over time. 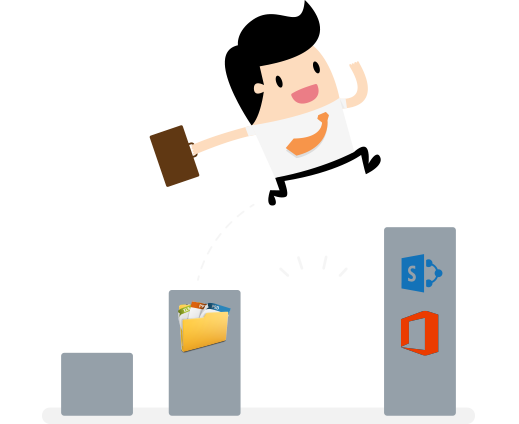 This makes the content migration of file shares to SharePoint Online or Office 365 very complex. One of the main reasons for a SharePoint content migration and / or Office 365 is that these environments are easier to search and find relevant content than file shares. To optimize the findability of documents, Xillio's migration solutions focus on transforming, clean-up and enriching content. After an extensive analysis of the content collections on your file shares, Xillio provides intelligent migration tools and services to enrich content by improving metadata, classifying content, by applying versioning (e.g. different versions of documents are 'stacked' in SharePoint) and de-duplicating documents. This way, only valuable content is migrated to your new collaboration environment. It has been shown that only 10% of the content stored on file shares is valuable enough for a SharePoint online migration or a migration to Office 365. Why migrate more than 10%? Please contact us or request a quote. No worries. We support all SharePoint migrations!